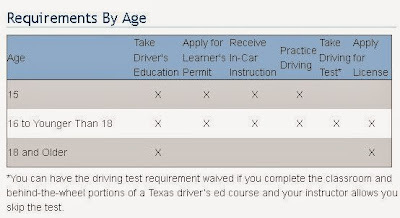 Impact Texas Young Adult Drivers Ed: How to Get Driver License in Texas Over 18? How to Get Driver License in Texas Over 18? 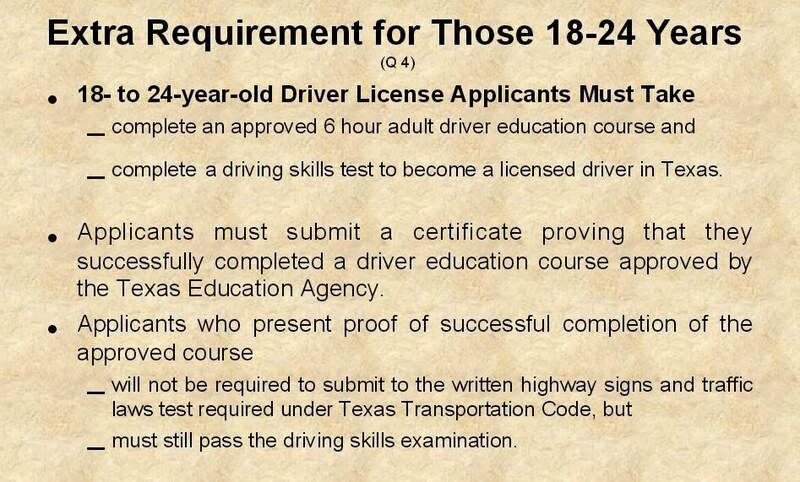 According to Texas law, starting March 1, 2010 anyone age 18-24 who is applying for their first driver license in the State of Texas must complete an approved driver education course. Individuals between 18 and 24 years of age are required to complete a driver education course and present the original certificate of completion at the driver license office. A driver education course is not required for individuals who already hold a valid driver license from another state or country. How old do you have to be to get a driver's license in texas? Adult driver education is mandatory for first time drivers between the ages of 18 and 24. Adults 25 and over may choose to take the online class if they want to. In Texas, individuals under the age of 25 must complete a drivers education program to obtain a license. Behind-the-wheel training None Yes (34 Hours. *Please contact the driver training school directly for more information. **Traditional driver education requires the completion of classroom instruction and behind-the-wheel training. How to get a license in texas over 18 to 24? Once you are done with the six hour adult driver education course, you will get certificate of completion from the course provider. See for the driver license online course for texas with free overnight shipping of certificate option to get it delivered to you on the same day. Go through the Texas Driver's License over 18 Checklist. Submit this original certificate of completion at your local DPS while you scheduled an appointment to sign up for your eye(vision) test and road tests (behind the wheel) so you can get your texas dps drivers license right away. Register for Young adult driving course and prepare to get your driving license online. My first week of driving lesson, the coach from Port Macquarie Driving School expected me to drive the car out of its spot on the street. But then he had to drive us a few blocks away where it was less traffic.